But this was the Arrowhead 135 after all, requiring me to pull a minimum amount of gear in a sled through the snow in northern Minnesota. No small feat to get there prepared, to attempt or to finish as I found out. John Pearch and Dave Sieberlich, super support! Sometimes it is easier to start with the end, which for me began 14 miles from Melgeorge's (the 2nd check point). Sometime in the dark of night, trudging through the snow very slowly and very painfully I came upon a fire and 3 welcoming volunteers. I stopped to fill my Camelbak and mix more Perpetum and just enjoy the warmth of the fire and the place I was at (although it wasn't that cold, maybe 15 degrees or so). As I prepared to leave I asked "How far to Melgeorge's?" "14 miles, with lots of hills. And don't forget when you get to the lake, you still have about 2 miles to go." I knew I could trust these guys' telling of distance as they had snowmobiles and were used to this trail. And, normally, it would be only 14 miles. But I knew at the pace I was going I could count on another 7 hours. Maybe more, maybe less but I would be out there for some time. That was the beginning of the end. The next 14 miles felt like a death march. For the first time ever in a long run I was falling asleep as I walked, staggering around on the trail. For the first time ever in a long run I had very clear hallucinations in the daylight (a totem pole, some mailboxes, a power pole, a tree with some very cool faces carved in it). For the first time ever in a long run I was not having fun. And I don't mean the "Party! Everything is good fun!". Because just running, pushing myself and attempting to reach a goal is fun. I was moving so slowly and with such pain that there was no fun being had by me. I know, I know, enough with the pity party. But that is what this run had become. I tried every trick I could think of to turn my thinking around. I thought of my mom and Sean, whose strength at fighting cancer (two times EACH) has helped me through some of my toughest runs. I listened to music. I thought of the people that donated to the Leukemia Lymphoma Society in support of this run. I sang. I pictured Elena, my source of hope. I ran. I thought of the people back home cheering me on, watching my progress on Spot. I walked. I tried to cry. I yelled at myself for being such a wimp. I laughed at the little mice that ran across the snow in front of me and got confused in my head lamp. I thought about John and Dave who were both putting out a lot of time and effort to be there with me. I thought of the finish, the trophy, Badwater. As I pushed the final, never ending two miles across the lake I was painfully aware that I had a decision to make. But first, to check in, eat, take some ibuprofen and sleep. As John woke me up around 11 a.m. and gently tried to get me to start moving, I had to tell him I was sure I was done. He did his best to talk me into going on but I knew I was done. Ultimately I was moving too slowly (1.5 to 2 miles per hour) and too painfully and I didn't believe I could make it another 65 miles (or through the rest of the day until the sun set, through the night to the following sunrise, through that next day including lunch time to the sun setting yet again before I made it to the finish). It was too much to wrap my brain around or push my body through. I honestly felt I was risking injury at that point and I did not want to risk being out of running for a month or more when I have bigger goals to attempt. I was and am disappointed I didn't get to the finish but I still honestly believe I did the best I could at Arrowhead 135 given the conditions and how prepared I was. So, what was the source of what went wrong? It got too warm. 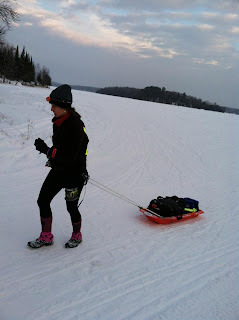 It was about 9 degrees at the start and the snow surface was easy to run on top of and my sled pulled very well. Almost like pulling on butter. At some point it warmed up to around 22 degrees and never cooled off to single digits. This changed the texture of the snow to being very similar to dry sand. Like at the ocean dry sand. Very hard to run in and hard to pull a sled in. The lack of a solid surface to land on caused my feet, ankles, shins, calves, hammies, glutes...(everything!) to torque and twist. Motion became very painful. I underestimated the effort of what I would be doing. I knew it would be a lot but I didn't realize how much. Running 72 miles without resting is not a big deal, usually. Running for over 24 hours without resting is not a big deal, usually. But on the Arrowhead I was exerting so much more and moving so slowly that it was mentally very tough. I think I also didn't snack enough for the effort. The first part of the race was really uneventful. The snow was great, I made great time into the first check point getting in just over 10 hours after the start. The hills started after that but they weren't so bad because I'm from Washington state and they gave me a reason to go slowly. I met some really great folks but for the most part I was alone which wasn't a big deal. John and Dave were there so I got to see them at a road crossing and at the two check points which was super nice. I listened to some music which helped with the boredom of seeing just the white trail in front of me. The 100 lumen headlamp they talked me into buying at REI was super awesome! Another runner commented that she kept thinking I was a snowmobile because my light was so bright. Pull the sled and tire MORE in training. And walk more in training. How much is more? Doesn't matter, just MORE. I don't think you can do it enough unless you do it so much you hurt yourself. Practice with and use poles during the event. I think this would have helped save my legs. I don't think I could have or would have trained on sand had I been able to predict the snow would turn into sand BUT poles might have helped with muscular endurance. Bring more gels and use them. I was prepared for uber-cold (the usual -20 degrees or colder) so I didn't pack many gels thinking they would freeze. With the forecast as mild as it was I should have packed more gels to supplement the Perpetum drink. I also needed one more way to store snacks, like trail mix, on my body. I think I would have snacked on that pretty consistently. Put screws in my shoes instead of using "yak-trax". Yak-trax hurt the bottom of my feet to run on. I should have known this as I ran a marathon in the snow last spring and had that same problem. Plus, with the warm snow I just took them off and I don't think it hurt me that much to not have extra traction. I would NOT wear gore-tex shoes. It is so dry over there that I think wearing a more breathable shoe would be better to help keep the sweat evaporating. I have run 100 miles with wet feet before and got no blisters. I got two moisture blisters during Arrowhead. Now, this might be different if it was uber-cold. BUT the locals wear a heavy canvas as their outer layer jacket. I think breathable is generally more important there in the dry on northern MN. What I did that worked? A lot actually! Getting ready with some pretty solid gear choices! I wore trail running shoes with two layers of socks. Drymax winter socks right next to my feet. For the conditions we had, this was enough. Heavy tights on my legs. That's it. On the top, a Smartwool long sleeve top, a short sleeve biking jersey (with back pockets to hold snacks and keep them from freezing), a 4L Camelbak with Perpetum drink (which I drank from every 15 minutes), old socks with the feet cut off for arm warmers, a fleece jacket with pit zips and pockets. I never took took off any of these layers to cool off. The zippers were enough that I could adjust my temperature as needed. I put the Camelbak hose down my sleeve and the mouth piece came out by my hand. Had it been uber-cold this would have saved me I'm sure (in addition to draining the tube every time I drank from it). I wore a light weight beanie on my head the entire time (which really surprised me. I thought I would take it off for sure). Gloves with eventually hand warmers and then mittens on top of that when I got cold in the night. I'm super happy that I did this event. Even happier that I raised some money for The Leukemia Lymphoma Society. This was by far the hardest thing I have yet attempted and, yes, I hope to try it again or another cold/snowy ultra. Arrowhead tested my mind in ways it hasn't yet been pushed. But next, it is time to try and get into the big dream. Your description of your decision to drop out sounds so much like mine at Rocky. Sounds like we both made the absolute right decision, but it sure is disappointing, isn't it? I KNOW our experiences will make us stronger, however. I am so proud of you and happy to have you as a friend. I was thinking the same thing when I read your report. Glad you still feel good about what you did. Isn't it great to have so much understanding coming from our running friends? Great analysis of what went wrong and right. You're one tough, sensible cookie! Maybe two cookies. Perhaps a toffee bar. Great insight Heidi. Remember to come back to this report when training for another. I sometime forget to do that and make some of the same mistakes ... or forget what I did right. For shoes, I have been running with the Outdry technology. They seem to work well for me. I only wear one pair of socks (Drymax) at a time - too afraid to try 2. Drinking more water may keep you warmer too. Great race report and proud of you for telling the world about your experience. I know it was hard to have to drop but as Betsy pointed out these are times that will make you so much stronger for future races! Glad I could be there. Love you! Excellent write up Heidi, Now for BADWATER! The opposite extreme. Found your blog from the Badwater site. I like to read how runners from Washington prepare for Badwater. Good luck in your training. I am a mom, a runner, a lover of animals, a teacher and a coach. I try to do things in life that will bring me and others joy. I have been running ultras since 2008 and I guess I might write about it, or life, on occassion.